The whirlwind activity of the holidays is behind us, decorations are packed away, and winter is settling in here. The first snowfall of the season arrived overnight and, while it’s only an inch or so deep right now, I’m finding myself already looking to the big, snowed-in-for-days storms that are always just around the corner this time of year. Today, I’m sharing our traditional New Year’s Day dinner – a hearty, spicy, absolutely delicious black-bean and cabbage stew. 2017 marks the third year in a row I’ve served this and it’s still a family favorite. 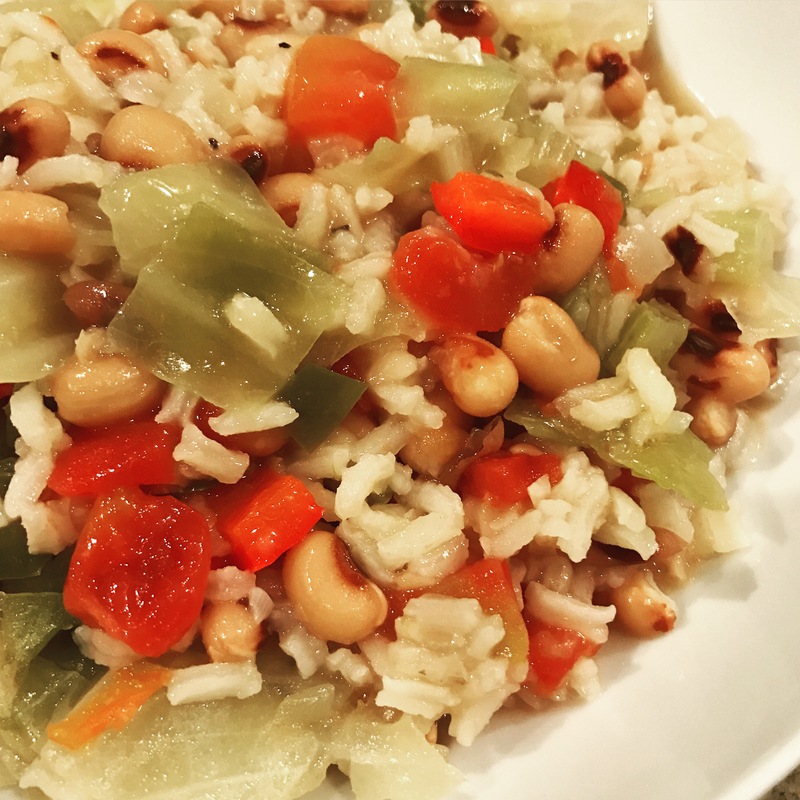 Our traditional New Year's Day Black-Eyed Pea and Cabbage Stew. Here's to health and wealth in 2017! In a large skillet over medium high heat, bring butter and 2 cups of broth to a boil. Reduce heat to low and add cabbage. Cover and simmer 30-45 minutes, stirring frequently, until cabbage is wilted. Season with salt and pepper. Remove from heat and set aside. Add the onion, green pepper, red pepper, and celery; cook, stirring frequently until vegetables are softened. Stir in the remaining 2 cups of broth, rice, black-eyed peas, diced tomatoes, and garlic. Bring to a boil, then reduce heat to low and simmer 45 minutes. Add 1 cup of the cooked cabbage and continue cooking an additional 15 minutes, or until heated through.